By Sunset Parkerpix, via Flickr. On the front stoop of a four-story brownstone in Brooklyn, New York, three women sat and strategized. “We should have broken down the door yesterday,” Sara Lopez lamented. “The day they help us,” she waved toward the official from the Department of Housing Preservation and Development who was milling about in the street outside, “will be the day a dog dances outside on one leg.” Lopez was in a bad mood that day, she said, although truthfully she seemed no more hot tempered than she is on any other day. Francisca Ixtilico nodded. Breaking down the door had been her idea. A short, hunched woman who was formerly an organizer in Mexico, she always had the group’s most radical ideas, which she usually introduced with the phrase: “What we did in Mexico was…” Sue Trelles, the most well mannered and well dressed of the trio, held her tongue. In general, breaking down a door might be below a woman of her status, but Trelles knew she had a right to live with dignity and that sometimes fighting for that right would take doing whatever needed to be done. The problem was that the building’s landlord, Orazio Petito, and his lackey superintendent kept the basement door locked tighter than Fort Knox, preventing city inspectors from cleaning out the rotting garbage or fixing the overtaxed fuse box that sparked and shorted, threatening to burn the whole building down. Of course, the door was really just one barrier — a metaphor almost, for the powers the women had been battling all their lives: slumlords content to let the women burn or freeze to death; employers who coerce and threaten after accidents or mistreatment; police who never seem to come when they need help on their block; and the vaguer but ever present forces of racism, sexism, language and deportation. But when confronted with the laundry list of oppression that low-income immigrant women face in Brooklyn, the best thing to do is to start with the problem most likely to burst into flames. That’s why, for over a year, Lopez, Trelles and Ixtilico have been knocking on doors, holding meetings and organizing a multi-building rent strike that has now captured local and national attention. But as photos of the snaked wiring and firecracker fuses appear on the nightly news, the real story is not the crumbling building or the landlord’s abuses but the three women and neighborhood organizers who have turned this injustice into a powerful example of community building and community-led organizing. The rent strike started two years ago when Sara Lopez woke up early one morning. No one sleeps much in these three buildings — in the winter there’s no heat, in the summer there’s no electricity, and all year there are rats and cockroaches scurrying in the walls — but that morning Lopez had slept even worse than usual, and she was mad. At each door she and Trelles spread a clear message: Stop paying rent. It wasn’t an idea born out of an ideology regarding private property or capitalism or self-governance. Instead, Lopez — a retired public employee who says she still has faith in the power and intentions of the local government — was espousing a radicalism born from necessity and experience. She knew that tenants could run the buildings better than Petito, whom she called un payaso, which means “clown” in Spanish but sounds far more poisonous than that when hissed in her Honduran accent. In the winter of 1982, after a former landlord simply abandoned the buildings without heat, Lopez brought the buildings’ families together, and they governed themselves — collecting money to pay the bills and replace the boiler, and forming teams to clean the hallways, put the trash out and make repairs. “We were the owners for six months,” she remembered. The negligent landlords returned, however, so Lopez once again brought the tenants together, hosting community meetings that grew until the whole first-floor hallway was packed. Many of the residents were afraid; a number of the tenants lacked U.S. residency papers, and once the strike began Orazio was quick to knock on those families’ doors first, waving forged eviction notices and threatening to call immigration. Francisca Ixtilico wasn’t intimidated. She recognized Sara’s ideas from the Catholic organizing group she’d joined in Mexico, in which they’d used strikes and direct action to win house repairs, stop evictions, and pressure local government to fund sports fields and other public projects. She placed a small red sign in her window for all the world to see: “Rent Strike.” Other tenants soon followed suit. Brazen words and actions have been the hallmark of this campaign, which is pushing the community not only to stand up for their rights as tenants, but to also reconsider social and political marginalization itself. About 80 percent of the neighborhood’s residents live below the poverty line, and the majority speaks either Spanish or Mandarin as a first language. But in a society where immigrant women who speak little English are often bullied, intimidated or ignored, these women are loud, assertive and highly public about their right to live with dignity. And they are teaching others to push back as well. “What do you want to know about me?” Lopez asked when I proposed writing about the trio. “I am a fighter, I fight for my rights, and I have a knife.” She started to laugh. As the fluent English speaker, Lopez is the de facto spokesperson of the group, but that doesn’t mean she censors herself. Trelles told me she was “proud to be an immigrant” from Ecuador and showed off her spotless apartment decorated with her daughters’ academic awards and sprinkled with flashlights so her youngest can keep working and reading during power outages. Ixtilico literally chased a younger tenant down the sidewalk, insisting that she stop being afraid and tell me her story. (The woman did, professing that she too had joined the rent strike, but asked that I don’t include her name because of her immigration status.) And as for the men, the trio seem to appreciate them, love them and humor them — but, like many of the historic rent strikes in New York City’s history, this is a women’s show. As the strike grew to the majority of residents in all three buildings, the neighborhood began taking notice. Cars and walkers slow to read the signs and discuss the strike, the news segments and their own decrepit buildings. “I’ve lived here for 12 years, and I’ve never seen something take off like this,” said Priscilla Grim, who lives a few blocks away from the buildings and works as a social media team member for OccupyWallSt.org. She and other neighbors from Occupy Sunset Park and writers from the Occupy-affiliated, Spanish-newspaper Indig-Nación joined three weeks ago, bringing new organizing tools and media attention while learning from the women’s low-tech, word-of-mouth campaign. 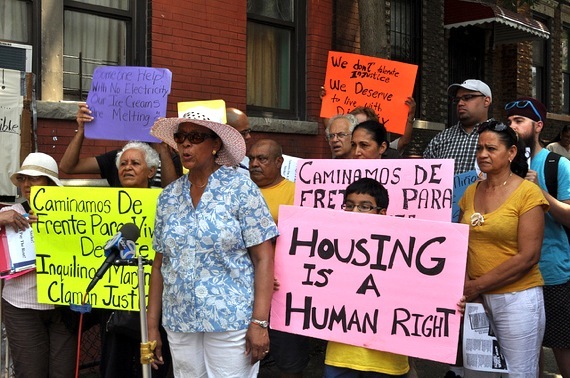 Soon, the residents and Occupy Sunset Park began gathering for bilingual meetings, sharing resources and planning press conferences, marches and even the occupation of Assemblyman Felix Ortiz’s office. Housing activists from Take Back the Land and the New York City squatting movement joined in, pushing the conversation toward transformative visions of community control of the buildings. These are visions that the women already saw and believed in, even if they didn’t have words for them quite yet. Wednesday afternoon, as the women waited to see if anyone from the rotating cast of building inspectors, health workers, fire marshals, police officers, elected officials or news cameramen would be willing or able to open the door, a suited man in a shiny black SUV drove up and started taking photos of the buildings. After being asked what he was doing there, he said he was a prospective landlord who had caught whiff of a possible investment. “He’s probably a detective,” Lopez said, shielding her face from the camera’s lens. “Besides, we don’t want any more landlords,” said Ixtilico. The Truth is always on our side but we still have to put up a good fight. Congrats to all who never gave up today you are the perfect example for us all!!! Jennifer Romanelli Mitchell This is an example of Horizontalism democracy in action. It reminds me of South American women taking their factories back and it’s awesome! this is truly incredibly, how wonderful!